ACHR, now 24 years old, is a coalition of Asian professionals, NGOs and community organizations committed to finding ways to make change in the countries where their work is rooted - change that goes along with the particular realities of their own cultures, politics and ways of doing things. The collective experience of all these groups represents a huge quantum of understanding and possibilities - Asia’s own home-grown development wisdom. After linking together as a coalition first in 1989, we began exploring ways of joining forces and supporting each other through a growing number of joint initiatives: housing rights campaigns, fact-finding missions, training and advisory programs, exchange visits, workshops and study tours, projects to promote community savings and community funds and citywide slum upgrading. This mutual support and cross-pollination of ideas between Asian groups is important, because so many of the development theories, planning paradigms and urban development models which set the course in Asia - and which we are often obliged to follow - are transplants from somewhere else. And sometimes in our rush to grow and to develop, the wisdom and practices that have sustained Asian societies for centuries get lost, and we forget our own considerable human wealth. The skyscrapers and the shopping malls may be going up fast and furiously, and our “tiger” economies may be booming, but the gap between rich and poor is getting wider, and slums and squatter settlements are still spreading faster than solutions from the government or the market sector can keep up with. Through this collaborative work over many years, all these people and organizations in the coalition have found that they had one crucial thing in common: a belief that the key resource to solve our enormous problems of poverty and housing is the people who experience those problems directly, who are most urgently wanting change and most vitally motivated to resolve those problems. The poor themselves represent Asia’s greatest and least-tapped development force. Unlocking that huge problem-solving force . . .
Now the ACHR coalition’s work has come to a new stage of scale and action, with the ACCA Program, which brings together many of the elements these groups have developed over the years and taps this huge people’s problem-solving force. The program allows people in a city to come together, think together, look at their problems together and take action right away to start fixing them, using the simple tools the program offers. And as this action by people grows in scale and strength around the Asia region, it becomes a new, proactive political process also, in which the poor are winning support for their initiatives from their local governments and other local stakeholders and becoming vital and accepted development actors in their cities. 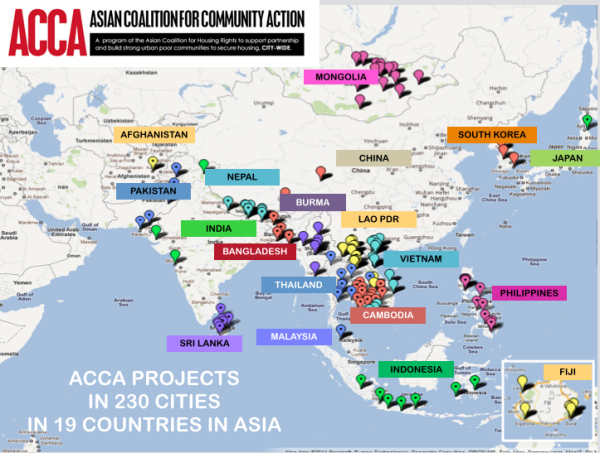 The ACCA Program is now supporting groups in 165 cities, in 19 Asian countries to take action in different ways to show visible change by people, to show that poor people themselves can make this change, and to show this change happening at scale. The program allows the implementing groups in different cities to meet often, to compare notes, and to work together in new ways and with a new intensity, to bring the region’s community-driven and citywide development processes up to a new level, through ACCA-supported projects they use to strengthen their initiatives. In this way, the ACCA Program is becoming a new learning platform in the region - a platform which allows community groups, professionals and local officials to see, to learn, to share, to grow and to develop a common direction - a common direction that is community-driven and citywide and rooted in Asia’s own politics, its own cultures and its own social realities. The ACHR Coalition's regional activities are supported and coordinated by a small secretariat, which is based in Bangkok and is registered as a non-profit foundation in Thailand, with registration No. BKK-287, dated 8 June, 1994. A program of the Asian Coalition for Housing Rights to support partnership and build strong urban poor communities to secure housing CIT-WIDE. By 2014 ACCA has stated Citywide upgrading activities in 165 cities and towns in 19 countries in Asia. Community Architects Network (CAN) is a regional network of community architects and planners, engineers, young professionals, lecturers and academic institutes in Asian countries. One of the most exciting developments of the past year has been the emergence of a new initiative to bring together Asia’s urban poor community networks and organizations into a new region-wide platform of sharing, linking, learning and support. Housing rights has been one of the most important issues in all of ACHR's work, from the coalition's very beginnings in 1988, to the work we are doing around the region today. ACHR's "Decent Poor" activity attempts to direct funds to support housing for these poorest in urban areas, as identified by and to be supported by their fellow community members, to ensure they are fully included in the housing and community development process. Of all the poor and vulnerable groups in Asian cities, those hit by disasters are often the poorest and most vulnerable of all. Besides losing family members, houses and belongings, many also lose their livelihoods and find themselves facing eviction from their land. ACHR has linked coalition partners into a Video and Public Media Network to promote learning and advocacy about a people centred development strategy. Currently around 14 countries are making videos. and sharing experiences of their interactions with public media. There is a long HISTORY leading up to the activities above ... enabling ACHR to expand ON-SCALE throughout 19 countries and 165 cities and towns. The next section of ABOUT US gives a summary of ACHR's develpoment history.